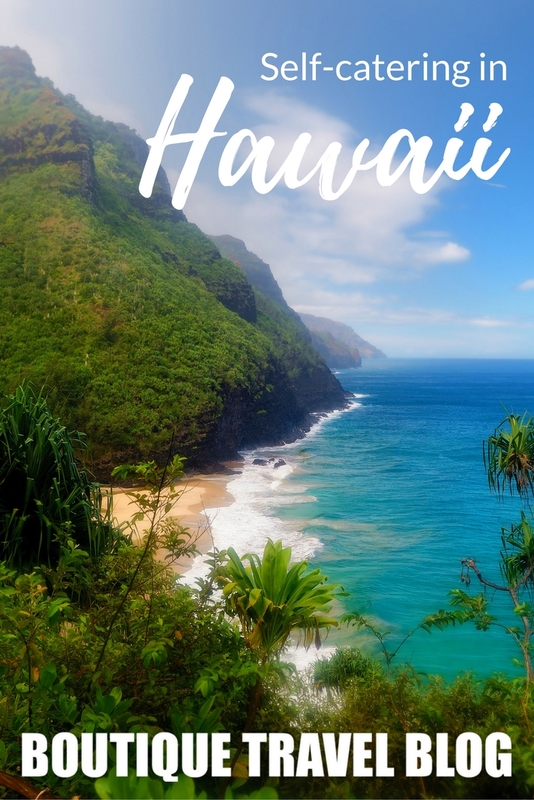 With its lush trees, beautiful beaches, and unique culture, Hawaii is at the top of the must-visit list of many travellers. But going to Hawaii can be a bit disappointing when you end up staying at a bland condo in a huge resort complex where the only thing that distinguishes it from any other place are the tiki torches lining the driveway. Yet this is the Hawaii that most people see. But there are places to stay in Hawaii which are unique and give you a more accurate flavour of what Hawaii is really like. I experienced one of these rare places on Kauai, the Garden Isle, at Fern Grotto Inn. 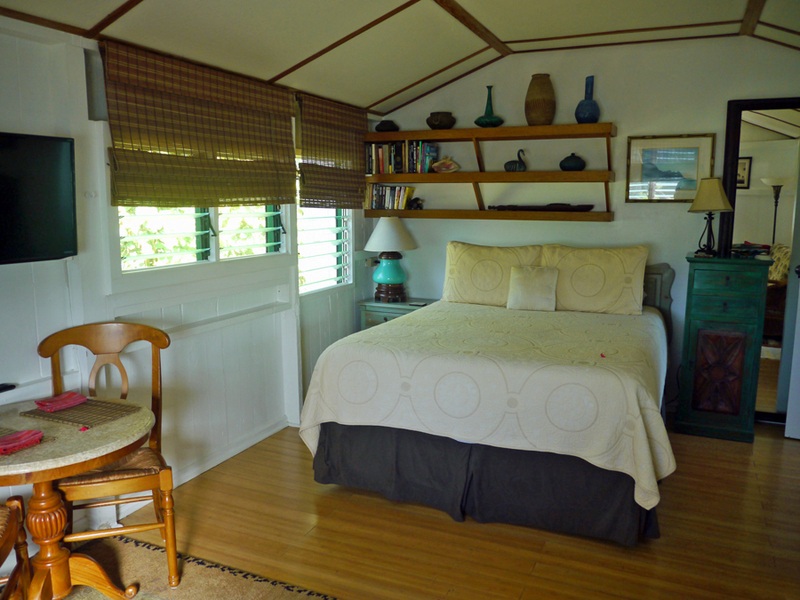 Fern Grotto Inn is a small collection of plantation-style cottages in a garden along the Wailua River. More a vacation rental than a hotel, guests have their choice of the six cottages, depending on their space needs. Because each has a kitchen, you can make Hawaiian ahi, poke, and lomi to your heart’s content. Even if you’re just two, I highly recommend the Ohana (“family”) House, the largest on the property. If you’re wanting to cook Hawaii’s fabulous seafood and produce (and, why wouldn’t you?) Ohana House has the kitchen all kitted out for you. There are even amenities like a waffle iron. With three bedrooms and three bathrooms, you could certainly have others share the airy Ohana House with you too. Some cottages have full kitchens and some a kitchenette. Which you choose just depends on how much space you’d like and whether you care about having a dishwasher and oven, or if a hot plate and microwave (and one of the barbeques on site) are all you need. Most of the cottages have air conditioning, but you’re unlikely to need more than a fan. Beds are queen- or king-sized and wrapped in soft sheets. You’ll have wifi and a television, games and books, and tips from owner Paul about what to see and do on the island. All bathrooms have showers, and some have tubs as well. Depending on your cottage, you’ll have views of the garden or the river. 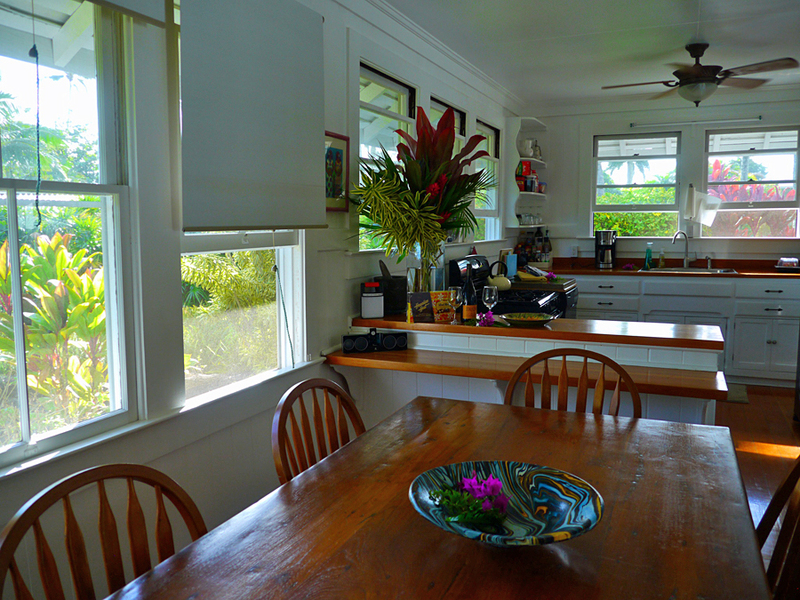 The cottages are all decorated individually, and you’ll be greeted with fresh Hawaiian flowers upon arrival. Fern Grotto Inn’s gardens are full of flowers and many fruits as well. Depending on the season, you can pick lime, kumquat, mountain apple, starfruit, avocado, sapodilla, pomegranate, and mango on the grounds. You’ll almost feel like a real Hawaiian, living in your holiday home set in peaceful garden and enjoying the warm sun, shaded hammocks, and cool breezes. 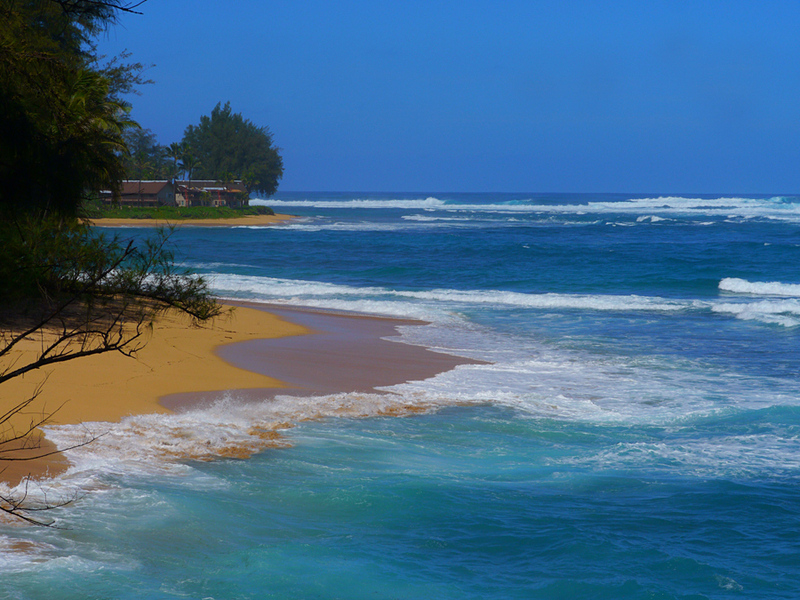 One of my favourite aspects of Fern Grotto Inn is its location in Kauai. Along the island’s eastern shore, the cottages are just a block from a long beach ideal for walking and surfing. 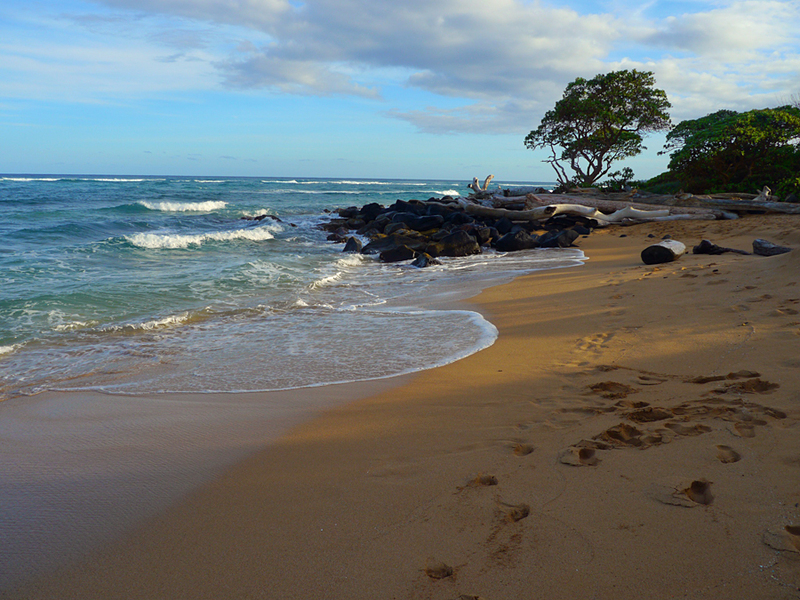 It’s just another few minutes walk or a short drive to Lydgate State Park, another long beach with a lava-rock walled area that protects swimmers from Kauai’s big winter waves. Fern Grotto Inn provides umbrellas, beach chairs, boogie boards, snorkels, masks, fins, coolers, and sand toys for borrowing during your beach visits. 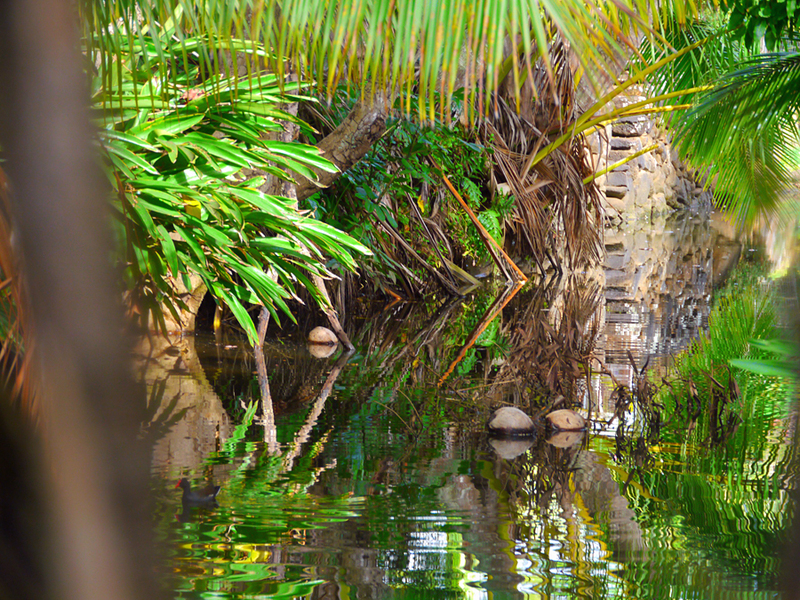 The inn’s property backs onto a short canal feeding into the Wailua River. You can borrow a kayak and paddle to your heart’s content along the wide flat river. I loved slipping into small streams and checking out the birds resting in the still water and peering into the mangroves which line the river. Paddlers who start off in the morning can take longer trips and kayak to Fern Grotto and to Secret Falls. Fern Grotto is a fern-covered lava cave where Elvis filmed Blue Hawaii. A half-hour hike from the river is the lovely Secret or Uluwehi Falls, a very popular Kauai day trip. By staying at Fern Grotto Inn, you’ll have access to the river and hike on Sundays too, the day boat rentals are not allowed on the river. You won’t need a car if you’re staying at Fern Grotto Inn — the airport is just a 10 minute taxi ride away, and you can borrow a bike to get groceries. But a rental car will allow you to explore more of Kauai, including its spectacular north shore and Hanalei Bay. You’ll also be able to drive to Waimea Canyon, “Hawaii’s Grand Canyon”, and to a variety of beaches and waterfalls. And don’t forget to stop by Jo Jo’s Shave Ice for a real Hawaiian treat. Whether you’re able to stay just a few days or if you have time to relax for a week or more, Fern Grotto Inn is one of the few places left in Hawaii where you won’t be in a garden-variety bland condo. Instead, you’ll stay in a unique self-catering cottage in a quiet garden near the river and enjoy a more traditional Hawaii. Check out what people are saying on Trip Advisor about Fern Grotto Inn. These look beautiful – Hawaii has been on my wishlist for ages, maybe I’ll finally get there in 2017? I think those garden-variety bland condos is perhaps why coastal Hawaii has never been on my radar – but these do look deal-makingly different. 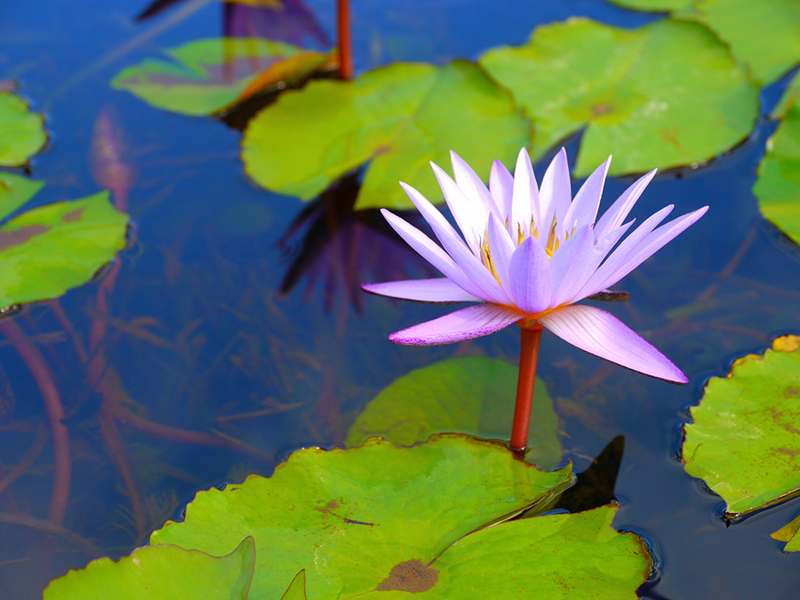 Oh, and that water lily picture….I think I need a print of that! Exactly — many places in Hawaii are so bland you feel like you could be anywhere. First of all, they’re boring, but you also feel like staying in them is contributing to making the islands one huge condo development instead of keeping it as natural and traditional as possible. Hawaii is not California or Florida! And thanks re the water lily pic 🙂 The gardens at Fern Grotto Inn were full of gorgeous flowers (and cute little geckos too). Fern Grotto Inn cottage looks wonderful and a great alternative to an expensive hotel. Agreed – much nicer than a boring hotel!